A refrigerator is an equipment that we cannot live without! We keep going to the fridge to get food, drinks or even when we don't know what else to do! A place visited so often needs to be clean and hygienic, don't you think? 1. Remove all the food, water, drinks, bottles, covers etc from your fridge. Empty your fridge completely. 2. Throw away all the rotten, molded and unusable food. 3. If you have 2 half-filled bottles of the same condiment, fill it up in one bottle to save space. 4. Remove all the removable parts like shelves, vegetables trays etc to clean on a regular basis. 5. Wash the removed parts in a sink using soap. Use room-temperature water to clean the glass parts. 6. 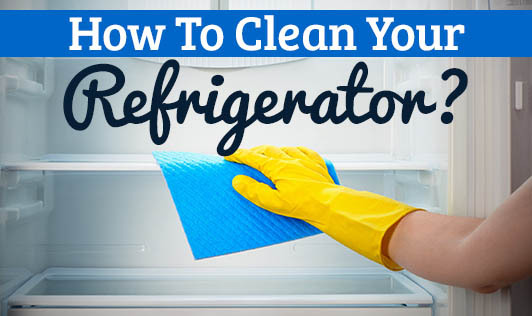 Clean the inside of the fridge with a clean cloth with the help of a cleaning agent or with equal portions of water and vinegar. Do not forget to wash the door as well. 7. Use a toothbrush to clean unreachable edges. 8. Wipe the loose parts dry and place it back in the fridge. 9. Put back all the food jars and bottles into the refrigerator.